Unfortunately, our family isn't at the point where we have extra money to invest. However, for those of you that do, this was a very interesting article by a reader about the ins and outs of investing in gold. Whether you’re a new or a more seasoned investor you’ll always be looking for a new route of investment and so the thought of buying gold bullion will have occurred to you. You might want to do this through exchange-traded funds and stocks or you might choose to buy physical gold instead. Buying physical gold isn’t an old-fashioned idea, although it’s an old one! It’s also quite easy as gold still comes in ingots (or bars) and coins. Which is best, bars or coins? It’s apples and oranges; it depends on what your plans are likely to be. If you buy coins you have more flexibility when it comes to selling them because you could sell 20 of your 200 coins, for example. If you have ingots, unless you have lots of the smaller gram-sized ones, then you have to sell the entire bar or you don’t sell it at all. You can buy several different sizes from Golden Eagle Coins, which offers more flexibility. Some gold coins are more valuable and useful than others, and some are only worth the trade price of gold. These rare coins, the ones that fetch the really big prices, are known as numismatic coins and they’re collectibles. If you’re new to coins and bars then you should really leave these alone for now and concentrate on bullion, which is valued according to the market price of gold. The biggest determining factor when it comes to how you invest and what you buy is your budget, of course. Gold dealers need to make a profit, or they wouldn’t be in business, so they buy their coins in at just below the market price and sell it just above. This difference in price is known as the spread and it changes with market conditions, as well as with your dealer. Once you’ve bought your gold, you shouldn’t be in too much of a hurry to sell it, mainly because you’ll be selling it below market price. You need to wait until the price of gold goes up enough to make it worth it. If your bars have appreciated by 40% since you bought them and you sell them at 5% below market price, you’ve still made a 35% profit. If they’ve only appreciated by 6%, then it probably isn’t worth it. Where should I keep my gold? 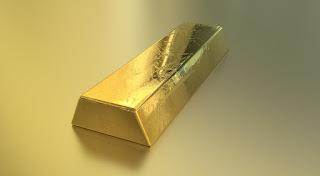 By far the biggest advantage to owning gold bars is that you have easy access to it if the banks suddenly crash. Your gold is a solid (literally) insurance policy that can help you out if currency ever becomes worthless. You can’t just buy your gold and then leave it lying around in plain view, though. Your best bet is a secure safe located somewhere hard to reach and out of sight in your home. Some investors keep some of their gold at home and some in a bank vault to spread the risk and it’s worth noting that your insurance premiums may rise if you keep your bullion at home. Do your sums before you decide what to do.